(CBS/AP) KABUL, Afghanistan  The Taliban are claiming responsibility for a suicide bomb attack in Afghanistan today that killed at least 10 people, including three American soldiers. 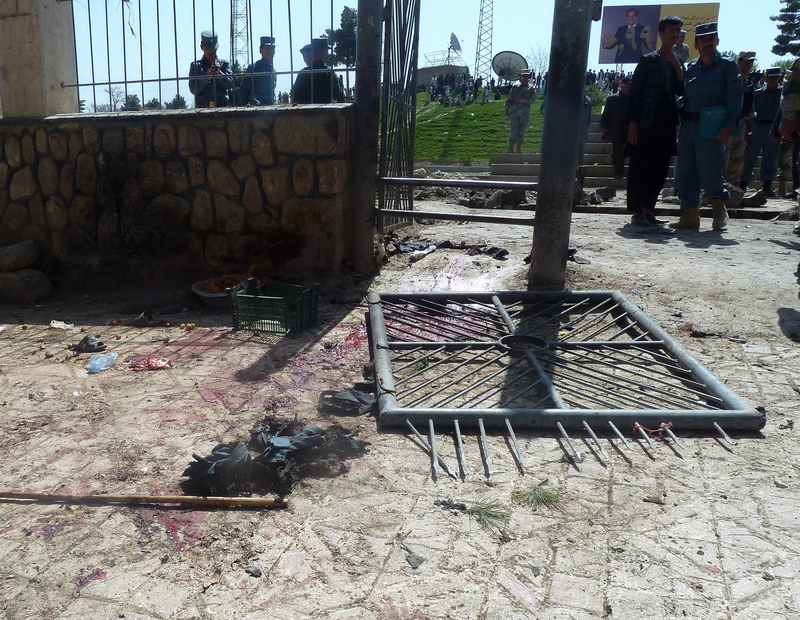 The attack took place at a park in a relatively peaceful area of northern Afghanistan. The Taliban have increasingly been targeting Afghan and NATO security forces as they try to assert their power and undermine U.S. efforts to build up the Afghan military. NATO said only that three of its service members were killed in a bombing. But a senior U.S. defense official confirms that the three dead were Americans. Norway and Germany, which have troops in northern Afghanistan, say none of their soldiers were involved. Militants are targeting Afghan and NATO security forces as they fight to assert their power and undermine U.S. efforts to try to build up the Afghan military, who will take the lead in combat responsibility over the next couple of years. Shortly before noon, the bomber detonated his explosives at the gate of the park in Maimanah, the capital of Faryab province, police spokesman Lal Mohammad Ahmad Zai said. His target was unclear, but Zai said four of the 10 killed were Afghan police officers. At least 20 people were wounded, officials said. Initial reporting suggested there had been separate attacks Wednesday, which would have accounted for the discrepancy, but NATO has confirmed it was investigating just one attack in the country's north. Meanwhile, the Associated Press reported that the three NATO troops were U.S. soldiers were killed, citing an anonymous defense official in Washington. Norway and Germany, which commands alliance operations in northern Afghanistan, said none of their troops were involved. Troops of other nationalities also serve in the area  most of them at a Norwegian base that works on partnering with Afghan troops so that they can eventually take control of security in the region. Associated Press video footage of the scene of the attack shows what appear to be dead Afghan civilians, police and foreign troops. Body parts are strewn around the gate and on the ground, which is spattered with blood. Faryab is relatively calm but is a stronghold of the Islamic Movement of Uzbekistan, or IMU, an al Qaeda affiliated group that has been most active in Afghanistan's northern provinces. The IMU was formed in 1991, originally aiming to set up an Islamic state in Uzbekistan, which borders Afghanistan. Later it expanded its goal to seeking an Islamic state across Central Asia. On March 26, a joint Afghan and coalition force in Faryab killed the group's leader in Afghanistan, Makhdum Nusrat. The coalition said Nusrat had been leading attacks against Afghan and coalition troops in the north for the past eight months and was plotting the assassination of a member of parliament in Kabul. Militants also have stepped up their attacks against international and Afghan troops nationwide in recent weeks. Nine Afghan policemen were killed and 11 were abducted across the nation in the past three days. Fighting in Afghanistan usually wanes during the winter months as Taliban fighters take a break because of winter weather, only to surge in the spring. Heavy snow covers many of the mountain passes used by the Taliban and other insurgent fighters to cross mainly into eastern Afghanistan from safe havens in neighboring Pakistan. Anger against foreign forces also has risen following a series of missteps, including the inadvertent burning of copies of the Muslim holy book and other religious materials in February and the massacre of 17 Afghan civilians allegedly by a rogue U.S. soldier. Foreign troops also have found themselves increasingly targeted by members of the Afghan national security forces, or militants posing in their uniforms. So far this year, 97 NATO service members have been killed in Afghanistan, including at least 55 Americans. Steven Seeley broke into the California governor's mansion in 2018. He had been homeless, living across the street and was dealing with schizophrenia. He met Judge Lawrence Brown, who oversees 140 active cases in mental health court, and was given a second chance. David Begnaud has his story.